1) Would you like to win this cute little hand-sewn cottage with embroidered roses? Noelle at Sew On and Sew On is giving it away in celebration of her 150th post. Congrats, Noelle! 2) Last night I bought Doodle Stitching for the Woollywotnots Sunday Book Club. I've been wanting to learn to embroider for a few years, and this book gives clear instructions for 17 different stitches to use on dozens of projects, like wall art, pin cushions, napkins, and bookmarks. I'm excited about starting a project this weekend-- it will probably be a little owl. 3 ) Lately I've been binging on movies. Do you go through phases like that, too? I've mainly been watching simple movies that don't require you to think very much like 17 Again, Adventureland, and High School Musical. I love Netflix! Another movie I saw recently was The Women. It didn't get very good reviews, but I sure enjoyed it. Definitely a chick flick. 4) I've been knitting more than usual the last few weeks and feel like I've re-discovered the joy that it brings me. As much as I love collage and other crafts, knitting relaxes me like nothing else. Some sort of mysterious process takes place when you knit that is directly related to your heart and spirit. I am so looking forward to colder weather so I can spend even more time snuggled up on the couch with my knitting and the two cats. 5) Jill at Mindfully Simple gave me a Humane Award. Thank you Jill! The award is for being kindhearted, and that means a lot to me. So I'd like to say thank you to those who have helped me to open my heart wider through your examples of generosity and thoughtfulness. Blogging has enriched my life, and I treasure the friendships that have developed with all of you through the sharing of our art, challenges, and daily life. Such great stuff, Stacy! And I was so happy to share that award with you. I have really loved getting to know you through the blog world - you have such a lovely talent for welcoming people, and your art is gorgeous! Love all your posts but this one really touched my heart. You are a sweet lady and so kind hearted. Hugs, Cory ooops Dogwood! Cute cottage:) Congrats on the award, well deserved! Knit on sister... someday you can teach me. Have a blessed day! Thanks everyone. 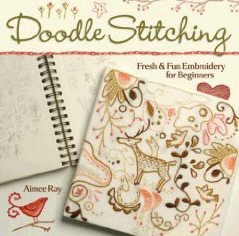 Doodle Stitching is a fun book and I can't wait to get started learning how to embroider. 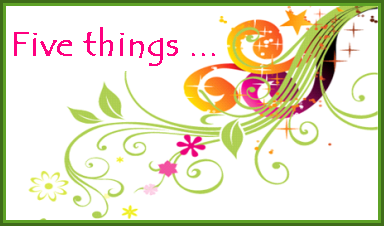 This weekend is a long one because Monday is the Labor Day holiday so I'm looking forward to crafts and movies. Hopefully I'll make it to the beach, too. Five great things Ms. Goldenbird! Like you, I'm looking forward to the cooler weather with no yardwork, which means extra time for stitching and knitting. Oh, and I've been knitting like crazy lately...I left for crochet for a bit this summer, but I'm back, and like you am rediscovering the joy in it!